DataOutputStream(OutputStream out) - Creates a new data output stream to write data to the specified underlying output stream. void flush() - Flushes this data output stream. int size() - Returns the current value of the counter written, the number of bytes written to this data output stream so far. void write(byte b, int off, int len) - Writes len bytes from the specified byte array starting at offset off to the underlying output stream. void write(int b) - Writes the specified byte (the low eight bits of the argument b) to the underlying output stream. 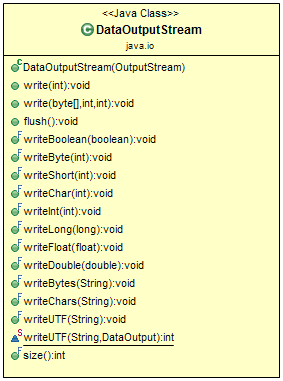 void writeBoolean(boolean v) - Writes a boolean to the underlying output stream as a 1-byte value. void writeByte(int v) - Writes out a byte to the underlying output stream as a 1-byte value. void writeBytes(String s) - Writes out the string to the underlying output stream as a sequence of bytes. void writeChar(int v) - Writes a char to the underlying output stream as a 2-byte value, high byte first. void writeChars(String s) - Writes a string to the underlying output stream as a sequence of characters. void writeDouble(double v) - Converts the double argument to a long using the doubleToLongBits method in class Double, and then writes that long value to the underlying output stream as an 8-byte quantity, high byte first. void writeFloat(float v) - Converts the float argument to an int using the floatToIntBits method in class Float, and then writes that int value to the underlying output stream as a 4-byte quantity, high byte first. void writeInt(int v) - Writes an int to the underlying output stream as four bytes, high byte first. void writeLong(long v) - Writes a long to the underlying output stream as eight bytes, high byte first. void writeShort(int v) - Writes a short to the underlying output stream as two bytes, high byte first. void writeUTF(String str) - Writes a string to the underlying output stream using modified UTF-8 encoding in a machine-independent manner. * Class to demonstrate usage of DataOutputStream class.